An offshoot of the iconic Cinnamon Club, serving Indian food with a twist. The inspiration behind Cinnamon Bazaar may be a traditional marketplace, but don’t go expecting to haggle. With rose gold walls, rich pink silk awnings and flower baskets hanging from the ceiling, this is a pimped-out bazaar for the business-lunch crowd. 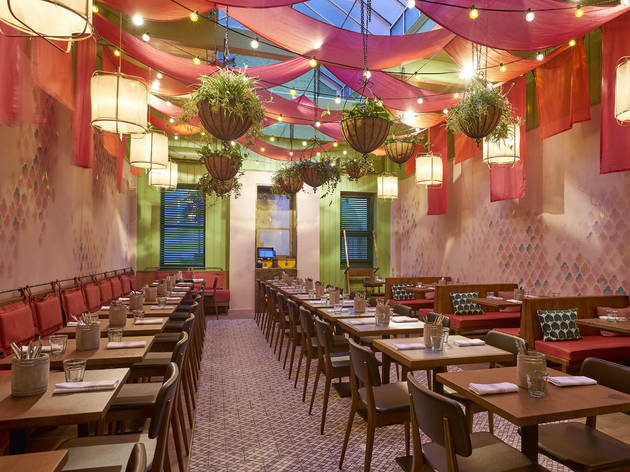 As an offshoot of Westminster’s Cinnamon Club – an old hand at high-end Indian dining in London – this kitchen specialises in imaginative fusions of East and West. The star dish was a lamb rogan josh shepherd’s pie; filled with cardamom-infused lamb and topped with buttery mashed potato, it was a perfect balance of old-school British comfort and tangy, warming Indian flavours. Another highlight was a Malabar boatman’s haddock curry rich with beautifully fresh fish. With the hits came a few misses. Service was slow (and a little clueless) and my carrot halwa roll pud came with an overbearing, clove-heavy ice cream. There’s also something about all that pristine silk decor that makes you long for a bit of dirty souk atmosphere. 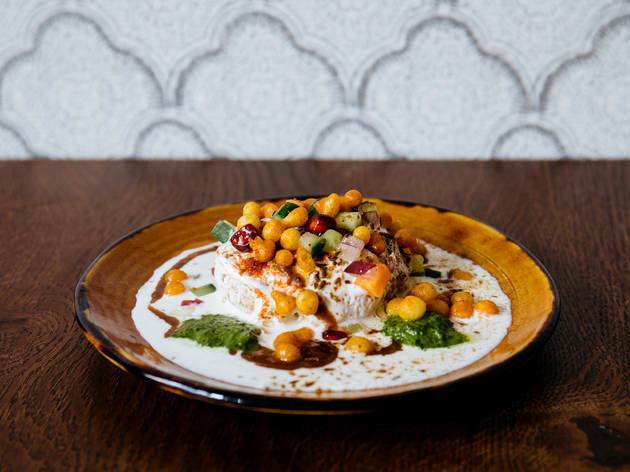 But if it’s a swanky work lunch you’re after, Cinnamon Bazaar will deliver the goods. And that shepherd’s pie might change your life. This place would have had much higher stars form me if the value had matched the quantity we got. Firstly I'm not against spice but honestly the food we had was way too spicy for me. Goodness. A simple watermelon dish had more spice than any of the curries we ordered.. How is that possible? And the £22 prawn dish I ordered had 3 small prawns a handful of rice and some melted greens... Honestly I have no problem splashing the cash but that dish was extremely bad value. I dont think they are good enough for the amount of money that was spent there... Sorry... 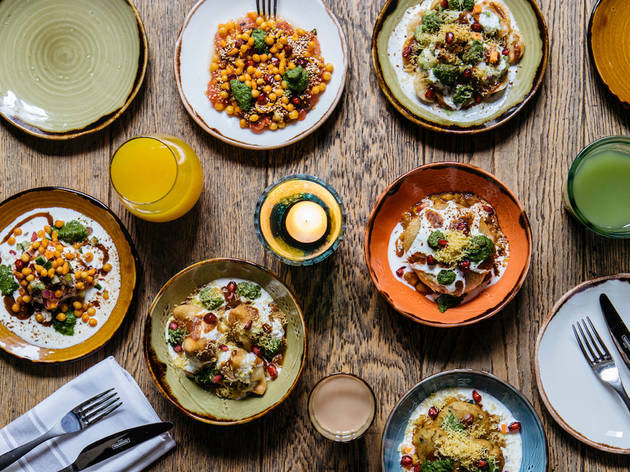 There are places like dishoom, hoppers and bengal kitchen dishing out delights at wayyyy better prices. Also I found the waiters too nosey and linger-Y... It made me feel uncomfortable and pressured. Amazing decor in the restaurant, a welcoming bar and fantastic staff. We popped in for a margarita believing this was still the site of a fantastic mexican restaurant and upon realising the premises had changed we decided to stay anyway. I was still able to enjoy a sublime margarita followed by a twist on the classic old fashioned cocktail. The cinnamon powder and coconut infused whisky was a delight and from what I saw, the food was just as good. Will be back to try more again soon. The service stood out for me at this restaurant. Staff were friendly and really helpful with explaining the menu and recommending dishes. I think the concept is Indian tapas but as we had a set menu it was difficult to judge. The lamb kebab for starters was so tender I thought it was raw. Apparently the texture is unique to this type of kebab and was created for someone very important back in the day. Without teeth perhaps? Anyway it was delicious and served with yummy chutneys and a paratha. I had a pork main which was like a dry curry. Slightly crispy but tender pork with a mild but very tasty marinade. Strangely the dishes didn't come with rice/nan but dhal, so we ordered some on the side to mop everything up. For desert I had a walnut and chocolate cake which was basically a brownie and made me very happy. My only gripe was that the voucher had the lamb rogan josh shepherds pie listed as an option but this wasn't on the restaurant menu for me. Would definitely go back. Tasty food, great service and a buzzing atmosphere. 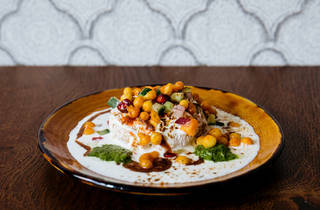 Cinnamon Bazaar is the hipper version of its sister restaurants. The decor is beautiful and the vibe is relaxed. However, I had a disappointing experience at their afternoon tea today. The vegetarian food options for the tea were mediocre in comparison to the delicious a la carte options which I've enjoyed on previous visits and the service wasn't up to its usual high standard. I will definitely be going to the restaurant for the a la carte menu but not the afternoon tea! 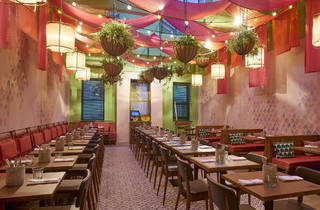 - Decor: This restaurant is soooo colourful! All the pinks, greens and oranges - Totally loved it! And there are plants everywhere. - Price: It has the look on the outside of a restaurant that would be very expensive but, as it tunrs out, it's very affordable! I was so happilly surprised! - Food quality: TASTINESSSSSS! The food smelled good, looked good, and tasted awesome! I had a lovely lamb main that was also served with an incredible yogurty, pink, pomegranate wonder. I would so recommend! - Service: All the staff members we encountered were adorable and very helpful. - Location: It doesn't get more central than the heart of Covent Garden and is located right across the street from a super cool Irish Pub so I believe that would be the perfect combo for an evening out. This is a beautiful restaurant nestled in the heart of Covent Garden. The set dinner menus are great value, if you're not looking to blow the budget, especially as it includes a cocktail which is almost half the price of the two course set menu. The cocktail list is crazy; I have never come across such an eclectic combination of ingredients. We tried a few of the cocktails, including the Gin Fizz which is Beefeater Gin, cream, saffron tincture, almond, lemon, egg white, soda. The Old Fashioned was probably my favourite although the Masala Coke float was nice but perhaps better suited to after dinner. The food is the real star of the show although some dishes are better than others, which is to be expected. The Crab and beetroot Bonda is visually stunning but it wasn't that exciting taste wise although it was enjoyable. The double cooked pork belly on the other hand is the stuff that dreams are made of. As I live in tooting surrounded by amazing curry houses I had very high hopes for this new Indian on my favourite street in Covent Garden. My four friends and I had booked a late 9.30pm slot and accidentally managed to qualifying for their 2 course set menu which we decided to opt for! After ordering four of each starter and four of the best mains (definitely order two of the Indian shepherds pie...lush) we split everything evenly and dived in to try it all. The cod was a surprising highlight with a really fluffy and tangy texture and all four starters exceeded expectations. A more affordable version of Cinnamon Club. We had to wait quite a long time for our mains but the good quality and affordable prices made up for it. 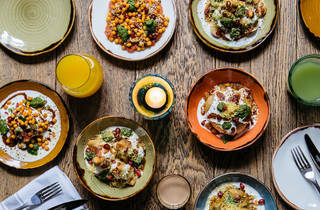 Cinnamon Bazaar by Vivek Singh is the latest addition to the Cinnamon Collection family following the successes of its sister restaurants The Cinnamon Club, Cinnamon Soho and Cinnamon Kitchen. Inspired by Bazaars dotted along the spice, silk and frankincense routes around India, the restaurant has a more relaxed feel compared to the other collection members. Bazaars, similar to marketplaces, are home to trade, socialising and entertainment and the influences of the colours, smells and energy successfully shine through the vibrant menu. The first thing that caught my eye on the menu was the varied chaat selection. Chaat is one my favourite Indian dishes - the casual roadside delight which includes yoghurt, savoury snacks and delicious chutneys bursting with flavour honestly makes my heart skip a beat. It’s so rare to find an Indian restaurant in central London with more than two chaat options so I was firstly impressed with the choice and secondly with how veggie friendly the choices were. My fave was the Aloo Tikki Chaat – a stand out dish and a great accompaniment when paired with other spicy dishes.